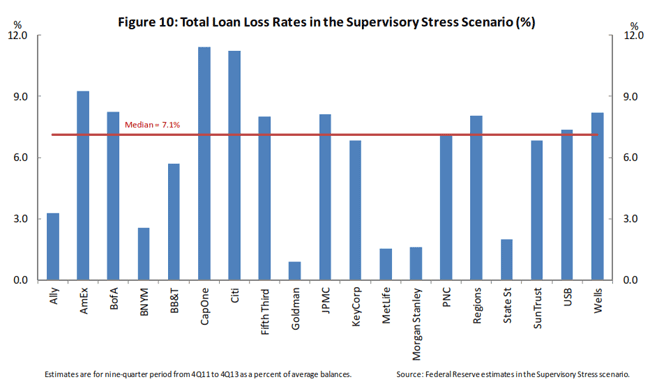 The March Mortgage Monitor Report from Lender Processing Services (LPS) showed a slight uptick in several measures of foreclosure activity, but overall the distressed loan situation appears to be improving. In March foreclosure starts rose 8.1 percent from February to 186,446 compared to 172,502. This is a 31.1 percent decrease from the 270,681 starts in March 2011. Despite the slight increase in March, there were fewer starts during the month than in nine of the previous twelve months. 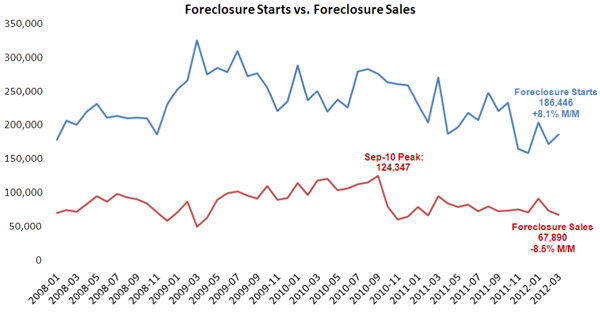 At the same time, first time foreclosure starts were up in March to the highest level in five months. Less than 40 percent of the starts during the month were for loans that had previously been in foreclosure. 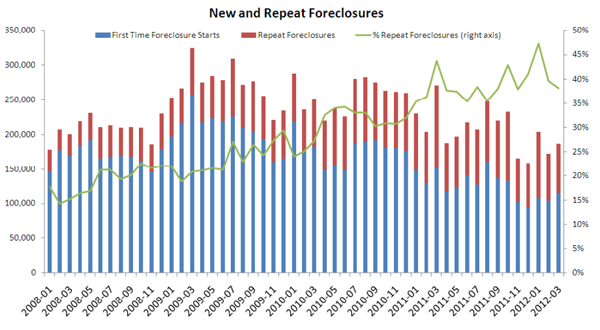 The national foreclosure inventory stayed relatively stable in March. At 4.14 percent it is near the historically high levels maintained since the end of 2010. 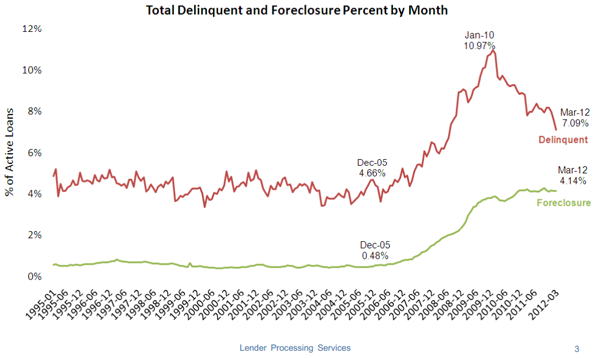 The judicial foreclosure states, however, have foreclosure inventories of 6.5 percent while the inventories in non-judicial states are 2.5 times lower at 2.45 percent. 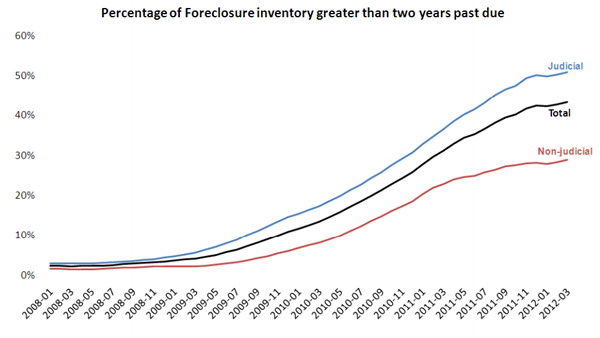 The foreclosure inventory continues to age. An estimated 40 percent of loans in the inventory have been there in excess of two years. In judicial states that number is closer to 50 percent. Foreclosure sales totaled 67,890 for the month, a decrease of 8.5 percent from February. This is the lowest level for foreclosure sales since December 2010 and almost half the number of sales that occurred in the peak month of September 2010. The states with the highest percentage of non-current loans continue to be Florida, Mississippi, New Jersey, Nevada, and Illinois. February mortgage originations rebounded somewhat from January lows, totaling 521,229 by mid-month. This was an increase of 10.4 percent for the month and 16.4 percent for the year. Prepayments, a key indicator of mortgage refinancing, increased across all investor categories.